My name is Rosie. 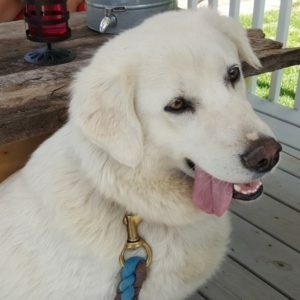 I am a beautiful, creamy white golden mix who turns heads wherever I go. When As Good as Gold rescued me, they found out I was positive for heartworm disease. I have completed my treatment and am ready for my forever family. I am not a high energy girl and am content to just hang out with you. I am very affectionate, love belly rubs, and always want to be touching you or near you. I lie at foster dad’s feet when he is reading and will lie by your side when you are eating … and you won’t find me begging for food! I am not a fan of tennis balls, but I do love my mouse, a Kong filled with peanut butter, bully sticks and busy bones. I am food driven as you can tell by most of my favorite toy list. I can keep your yard free of birds, squirrels and rabbits. I am on high alert when I am outside to make sure they stay away. I love to go for car rides! I check things out for a while and then relax and lie down. I love going for walks and sit patiently for my foster parents to get ready and put on my harness. I have some reactivity/fear issues and must live in a no child, no dog, no cat home and also shouldn’t be near any other small types of animals. I also don’t like seeing anything outside of the window of my foster home. My foster parents have actually put up a film on the windows so I can’t see the neighbor’s dogs. I would love it if my new home had a fenced in yard where I could run around. A privacy fence would be a huge plus, unless you are far away from neighbors and there are no dogs around. I saw a behaviorist for my reactivity and it was diagnosed as “Fear Aggression”. 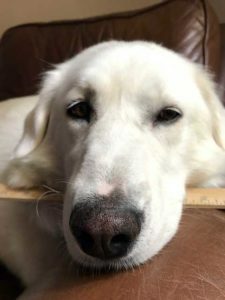 My foster parents have done a great job helping me with training techniques, but I still have a long way to go and will need a family that will be willing to continue working with me. If you are looking for a wonderful snuggle buddy on the couch and you will continue to help me overcome my fears, I will reward you by being a wonderful and loyal companion.